DEARBORN, Mich., Jan. 15, 2016 – Ford Motor Company and Jay Leno, renowned auto enthusiast and star of Jay Leno’s Garage, are teaming up to auction the TV legend’s personal one-of-one 2000 Harley-Davidson F-150 at the 45th Anniversary Barrett-Jackson Scottsdale Auction at WestWorld of Scottsdale. All proceeds will benefit National Multiple Sclerosis Society, the country’s leading organization helping people affected by multiple sclerosis through cutting-edge research, advocacy and education. Live TV coverage of the auction of this custom F-150 will air on Velocity, Jan. 29. 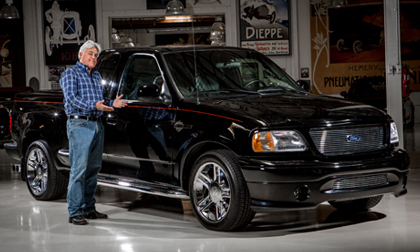 Leno will be on the block to help auction his Harley-Davidson F-150, (Lot #3006). Representing the first collaborative effort between Ford and Harley-Davidson, this distinctive pickup captured the imagination of auto enthusiasts across North America when it was introduced in May 2000. The truck is the only one in existence that features the SVT Lightning powertrain. Equipped with a supercharged 5.4-liter Triton V8, this custom monochrome black F-150 features distinctive Harley-Davidson orange pin-striping and badging and 20-inch styled chrome wheels. It cranks out approximately 360 horsepower that exits through a specially tuned single-inlet dual-outlet exhaust for a more robust sound. This custom Harley-Davidson F-150 has been titled to Leno since it was first presented to him by Ford Division President Jim O’Connor at Ford World Headquarters in May 2000. In addition to the latest Ford Performance models, Ford will have its full 2016 vehicle lineup on display at Barrett-Jackson Scottsdale, including the new Explorer and F-150, as well as all-new Lincoln sedans and SUVs. Auction-goers will have the opportunity to get behind the wheel of their favorite Ford Motor Company models for on-site ride-and-drives. Visit the Jay Leno’s Garage website on Jan. 18, for more information about the Harley-Davidson F-150 and an exclusive video featuring Leno and the truck. Ford Motor Company, a global automotive industry leader based in Dearborn, Michigan, manufactures or distributes automobiles across six continents. With about 197,000 employees and 67 plants worldwide, the company’s automotive brands include Ford and Lincoln. The company provides financial services through Ford Motor Credit Company. For more information regarding Ford and its products worldwide, please visit www.corporate.ford.com. Multiple sclerosis, an unpredictable, often disabling disease of the central nervous system, interrupts the flow of information within the brain, and between the brain and body. Symptoms range from numbness and tingling to blindness and paralysis. The progress, severity and specific symptoms of MS in any one person cannot yet be predicted, but advances in research and treatment are moving us closer to a world free of MS. Most people with MS are diagnosed between the ages of 20 and 50, with at least two to three times more women than men being diagnosed with the disease. MS affects more than 2.3 million people worldwide. For more information, please visit http://www.nationalmssociety.org/.